A few nights ago, I woke up from a nightmare in a cold sweat, a full-on, sheets soaked, cold sweat. In the dream, I’d been on a plane with my father, and the plane was crashing into the ocean. Now, it just so happens that my father and I are about to embark on an international trip in a couple of weeks, so I wasn’t surprised that some remnant of this old phobia had reared its head. I used to have a textbook case of flying phobia. I had never enjoyed flying, but when I was about 13-years-old, I had what I now recognize as a panic attack while on a flight with my parents. After that, I either avoided flying, if at all possible, or suffered through it with excruciating anxiety symptoms. As I progressed through my clinical training, I realized that what I was struggling with was treatable, however, it wasn’t until my clinical internship brought me to California that I was sufficiently motivated. I realized that if I ever wanted to visit my family and friends on the East Coast, I needed to do something. 1. I learned to avoid the avoidance trap: Avoidance is quite seductive, particularly, if it’s not something that interferes in your day-to-day life. Why fly? There’s a beautiful country to explore, with roads, that are attached to the earth! Once you start avoiding something that’s causing you anxiety or fear, it reinforces the idea that the avoidance keeps you safe, and you’re more likely to avoid in the future. Avoidance also increases your anxiety in the long-term, because it robs you of experiencing what you’re fearful of without a negative consequence. If you’re fearful but not avoiding, don’t start! Keep reading to learn how to better manage anxiety in the moment. If you are avoiding, begin to expose yourself to what you’re fearful of in small, incremental steps. Working with a cognitive behavioral therapist who provides Exposure and Response Prevention might also be helpful! I began booking flights whenever I had the opportunity, even though I was less than thrilled about it. 2. I learned how to relax my body: Even when someone is not a fearful flyer, their first response to turbulence is often to tense up. I would typically grab the arm rests until my knuckles turned white, or, on occasion, the person next to me, if they were agreeable. I guarantee you that your tense muscles are not holding the plane up, and in fact, are actually increasing your anxiety. Learning Progressive Muscle Relaxation can help you to relax those muscles and roll with the turbulence instead of fighting it! If you experience panic attacks while flying, Diaphragmatic Breathing can help you to get those symptoms under control. Remember to practice these techniques and master them well before your first flight. Now, when I encounter turbulence, I lean into it with relaxed muscles. 3. I learned about the mechanics of flight: A lot of fearful flyers experience anxiety around all of the noises, bumps, and smells that are associated with air travel. Knowledge is power, and learning what those sounds signify goes a long way toward soothing tattered nerves. Click here for a handy guide to all of the bleeps, bloops, and bumps which you’ll commonly encounter during air travel. Of course, this list is not exhaustive, and you’ll likely encounter unexpected noises and sensations. Once your overall anxiety is lower, you’ll be much better equipped to challenge cognitive distortions as they come up. 4. Speaking of cognitive distortions, I learned to challenge mine: Cognitive distortions, in brief, are thoughts that pop into one’s head, that produce a shift in mood, and are likely, not true. 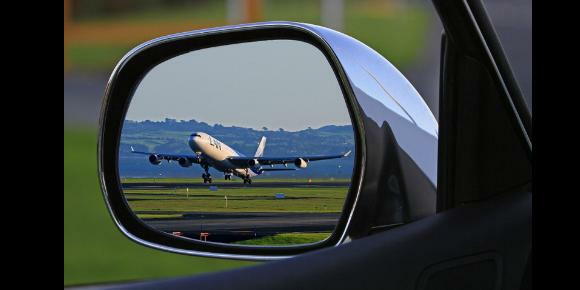 For folks with flying phobia, there are a couple of common distortions that tend to pop up when faced with the prospect of air travel; “The plane’s going to crash,” and “I’m going to have a panic attack and I won’t be able to escape.” Statistically speaking, air travel is much safer than car travel, and chances are, you do this everyday without a care in the world. Regarding panic attacks, learn to decatastrophize. When I fly, I remind myself that despite my anxiety, turbulence cannot knock a plane out of the sky, and that I’ll likely arrive on the ground safe and sound, just as I always have in the past. 5. I quit the safety behaviors: There are two types of behaviors that anxious flyers typically engage in. Flat out avoidance, which is pretty self-explanatory, and safety behaviors, which are much more insidious, and can perpetuate a phobia even after you’re no longer avoiding air travel. Safety behaviors take many forms, from bringing along good luck charms and talismans, drinking excessive amounts of water to ward off a panic attack, to drinking excessive amounts of alcohol. I used to constantly monitor the flight attendants for any sign that they might look nervous. You might ask, some of these behaviors sound relatively harmless, what’s the issue? As long as you engage in safety behaviors, you never truly get to have the experience that teaches you that you will be safe regardless of how many good luck charms you bring onto that plane. The other issue is that they don’t always work, like the time I was seated next to a flight attendant who began to panic and pray as the flight took off. The flight was fine, but my anxiety went through the roof! The more you can ditch the safety behaviors, the smoother your future flights will be. A lot of people ask me if I love flying, now that I am no longer afraid, and, perhaps unsurprisingly, the answer is no, I don’t. The key difference is that my fear no longer interferes with my life, it doesn’t keep me from doing things that I want to do. You may never love a clown, a spider, or a toilet seat, but with the right steps, these fears do not have to control your life. Dr. Scrivani specializes in the Cognitive Behavioral treatment of anxiety and related disorders, behavioral parent training, and provides tele-mental health services to residents of New York, Florida, and internationally. Call (888) 535-5671 or email [email protected] to set up a free consultation. Visit my website for more information.